Stamps: Stampabilities, House-Mouse Designs, "Mice Symphony" # HMOR1123, featuring Maxwell, Mudpie, Amanda, Monica.& Muzzy. The sentiment and musical notes are from the See D's "Let's Make Music" #50092 set. The large Scroll is by Stamp Cabana - Marg Hjelmstad design, 1996. I stamped the HM image onto the scroll and masked off the edges to make it seem as if the mice are in the scroll. This HMFMC119 challenge runs until Midnight, May 19th and there is also a fab prize from the lovely Heidi, at Simon Says Stamp. 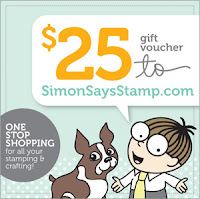 One Lucky Winner will receive a $25 Gift Voucher Prize to the Simon Says Stamp Shop! Remember that you too can enter your House-Mouse, Gruffies and Happy Hoppers creations directly into the "Stamped By Me Gallery" found over at the Official House-Mouse & Friends Site HERE. 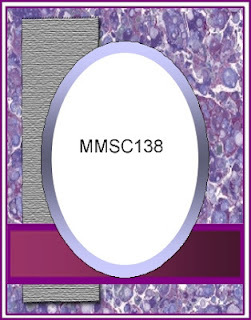 Just have fun and come play with us :) Check out the MMSC Blog to see all the MMSC137 winners. $10 Gift Voucher redeemable for any digi images in the "priscillastyles" Store. ( redeemable for digis only. Stop by and check out all the new images!! Lastly, if you haven't entered this FABULOUS CANDY giveaway, YOU MUST try if you'd like a chance to win this GREAT LOT of House-Mouse and Friends goodies for yourself!! Chuckle, chuckle - your creation is so cute and very well done! Welcome back friend, have missed you....hope things have evened out for you some. WOW, this is adorable. Not ever seen this stamp, and I love it. Those beautiful rich color tones you used are perfect, and outrageously beautiful. Absolutely gorgeous, America! What a fabulous take on the sketch and your image is cute as can be. I am awed by your impressive coloring and amazing details. Fabulous card. The image is adoable and your scroll is gorgeous. House Mouse images all make me smile so this really should be an easy challenge to enter! Love your card...gorgeous colors! what a fabulous and beautiful card and cute image america. Hi America wow adore this sticking cute image..made all the better by your wonderful colouring great design GF well worth the wait..lol lovely to see you back crafting.. I adore this fun image and just love every element of this gorgeous creation. Fabulous. America, this is amazing! Absolutely beautiful and full of exquisite details! Gorgeous card! WOW this is one very stunning card! I love all your fabulous details - gorgeous! wonderful card! love your great colouring and that image is too cute! thankyou for joining the fun this time over at craft your days away challlenge! wow, this is fabulous America! Gorgeous design and coloring. Great to have you back, America. Such a lovely creation you are sharing with us today. Fab colouring. This is just beautiful! Thanks so much for linking up with us at Delicious Doodles this week. Hope to see more from you soon! A great card and those mice look like they are having so much fun. Thank you for joining us at Craft Your Days Away. this card is just fantastic in every way, I love all the detail and beautiful colour. It must have taken you sometime to make the card but it was certainly worth it.